A new piece for Jamestown about the latest Europol annual terrorism report, focusing on the elements linked to North Africa and specifically Libya. There are a whole raft of issues in here that I really only touch on. The tensions this is causing within Schengen are fascinating to me. I wonder if retrospectively Libya is going to prove to be a major turning point for European foreign policy – the shift to coalitions of the willing outside, while internally a receding of free movement. Libyan migrants wait in line at the port in Benghazi, Libya. Without food, employment or security, thousands of sub-Saharan Africans are taking to the sea in overcrowded and unseaworthy boats in desperate attempts to escape the violence in Libya. 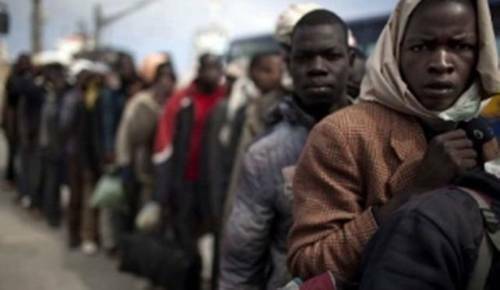 They are joining some 25,000 Tunisians who have already fled to the Italian islands of Lampedusa and Linosa in hopes of gaining a foothold in Europe. Many boats have been lost in the Mediterranean crossing, at the cost of hundreds of lives (AP, May 9; EU Observer, May 3). Last year, Mu’ammar Qaddafi struck a €50 billion deal with the European Union to regulate its borders as a “transit country” for refugees and economic migrants from Sub-Saharan Africa. Despite this payoff, Qaddafi has not hesitated to use it against Europe, threatening to “turn Europe black” if various demands are not satisfied (Der Spiegel, February 24). The French minister of foreign affairs, Laurent Wauquiez, has warned: “Libya is the funnel of Africa. Flows of illegal immigrants from countries such as Liberia, Somalia and Eritrea pass through Libya… We must defend our frontiers on a European level. What we’re talking about isn’t a few tens of thousands of illegal immigrants who could arrive in Europe; it’s a potential 200,000 to 300,000 this year” (Radio France Internationale, March 2). Taking a quite traditional view on events in North Africa, the recently published annual Europol (European Law Enforcement Agency) report on terrorist and counter-terrorist activity in Europe concludes early on that “in the short term, the absence of terrorist organizations amongst the mass Arab protests across the region has left al-Qaeda struggling for a response.” For Europol, however, there is a danger in the longer term that if the expectations of those on the streets are not met, “it could result in more powerful terrorist organizations impacting the European Union.”  Paired with the current tensions between Italy and France over boatloads of North African migrants who arrived in Europe via Italy and then headed immediately for their linguistic homeland in France only to be stopped by police at the French border – something infringing the free movement of even those possessing only temporary papers within the Schengen zone in Europe – the threat posed by a potential overspill of the Arab Spring into Europe becomes evident. The report mentions this potential threat early on, highlighting that “the current and future flow of immigrants originating from North Africa could have an influence on the EU’s security situation” by offering an easy way for terrorists to slip onto the continent. Events in North Africa are not, however, the only focus of the overall report and the main conclusions are, as usual, that separatist and left-wing terrorists are the most active in Europe. 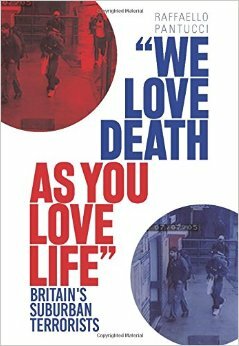 In total the report covers 249 attacks, with 160 considered separatist, 45 left-wing, three Islamist and one “single-issue.” Forty of the attacks were for “unspecified reasons” – all of these coming from the UK, which does not specify the ideological driver of British-based terrorist attacks. In fact, based on the numbers in the report, it is far more likely that European citizens are going to come into contact with separatist terrorists – 349 suspects are reported to have been arrested in the past year. In the UK in particular, this has become increasingly obvious as Irish dissident groups become ever more deadly – in April, a car bomb in Omagh, Northern Ireland killed Roman Catholic policeman Ronan Kerr, an act believed to have been carried out by the Oglaigh na hEireann (ONH – Volunteers/Soldiers of Ireland), a splinter group of the Real IRA (Telegraph [London], April 3; BBC, April 3). ONH operatives are reported to have been under surveillance recently by the Special Reconnaissance Regiment (SRR) while scouting potential targets believed to be related to the 2010 London Olympics (Belfast Telegraph, April 21). Dissident Republican factions have returned to violence to protest the recruitment of growing numbers of Roman Catholics to the Police Service of Northern Ireland, the replacement for the formerly Protestant-dominated Royal Ulster Constabulary. A few days after Kerr’s murder, a 500 lb truck bomb was found in Londonderry, and in the week before the royal wedding, the Real IRA paraded in a show of force through a cemetery in Londonderry. They concluded by delivering a speech in which they threatened police officers “regardless of their religion, cultural background or motivation,” as well as announcing that “the Queen of England is wanted for war crimes in Ireland and is not wanted on Irish soil” (BBC, April 25). But even within the resurgent Irish militancy in the UK there are hints of the threat from North Africa. Those with a keen sense of history will recall that Colonel Qaddafi gave Irish dissidents large quantities of Semtex explosives and it was being investigated whether some of this might have been used to kill Constable Kerr. Defecting Libyan Foreign Minister Moussa Koussa is believed to have played a major role in supplying Republican terrorists with Semtex. Conservative MP Robert Halfon said: “If this is true then we must take every step to indict Mr. Koussa in the international war crimes courts or in the British courts for allegedly supplying the IRA with weapons which appear to have killed a policeman on Saturday” (Telegraph, April 3, 2011). The EUROPOL report also touches upon the bigger strategic question that has been bothering experts about what the Arab Spring means for al-Qaeda’s global narrative. As the report puts it, developments in Tunisia and Egypt show that “peaceful demonstrations by ordinary people may be more effective than terrorist attacks” in effecting political change. However, the resulting “democratic space” could provide room for groups to “expand their activities,” using the “instability of state security forces” as an opportunity to launch attacks. The report notes the “clear contradiction to what al-Qaeda has insisted is the only means of defeating entrenched regimes is likely to result in a notable setback for terrorist organizations in terms of support and recruitment.”  So a short-term gain for terrorist groups may be overshadowed by a long-term loss. This conclusion, however, is based on data prior to the descent of chaos on Libya. It is unclear to what degree that state might become a new jihadist battlefield that spills back into Europe like Algeria or Bosnia did in the 1990s, or like Iraq and Afghanistan more recently. The overriding nationalist flavor of the fighters in Libya and the continuing presence of the rich target of Qaddafi and his clique is likely to keep fighters busy for the immediate future, but in the longer term it is unclear what the implications of this might be for European security. The report highlights “ongoing concern” about “the number of predominantly young EU nationals travelling to conflict areas that include Afghan/Pakistani border, Somalia and Yemen with the intent to take part in armed combat,” it remains to be seen if Libya will soon need to also be added to this list. 1. “TE-SAT 2011 – EU Terrorism Situation and Trend Report,” Europol, April 19, 2011:www.europol.europa.eu/publications/EU_Terrorism_Situation_and_Trend_Report_TE-SAT/TE-SAT2011.pdf. At last this long-awaited (at least in my mind) paper lands. It provides what I hope is a useful initial scoping exercise into the phenomenon of Lone Wolf terrorism that with further support could be developed into a framework for better understanding and countering this problem – both in its Islamist incarnation, but also in others. I have written bits on this in the past, but this is my first large article on the topic and I hope it generates some feedback and sparks some useful conversations. My hope is to locate support to undertake a longer investigation into this, and any thoughts in this direction are warmly welcomed. A final note to thank Lorenzo and Tim for very useful comments on earlier drafts – and of course thanks to the ICSR team for publishing and organizing the event. Here is the blurb off the ICSR website, and see below for a link to the paper. In the latest paper in the series of Developments in Radicalisation and Political Violence, ICSR Associate Fellow, Raffaello Pantucci explores the lone wolf phenomenon. As Al-Qaeda rethinks its strategy in the West, seen by a lessening capacity to stage large-scale attacks, there has been a rise in the recruitment of self-starters who are often radicalised through the internet. Almost impossible to detect, these ‘lone wolves’ pose new and unique challenges to the authorities and security services in the West. With this paper Pantucci creates some sort of typology to define this new group and offers some deeper understanding to this ever frequent and increasing threat faced by the West. For a summary of the launch event which we did in London around it (with charming photo), please look here. A new piece for HS Today, this one looking in some greater detail at the alleged Mumbai-style attack that had agencies in a great worry. Unsure this one is all over yet, and the information might ultimately have come out for just this reason. Am also going to try to do some more digging on the British end of it, which I think might be more precarious than this might suggest. Plots aimed at Mumbai styled assaults in Europe. Weeks have passed since Europe’s threat tempo was ratcheted up as security forces across the continent went into full alert in expectation of a possible terrorist attack. While nothing has actually happened from that particular threat with attention focused on the parcels out of Yemen, information has slowly started to leak out about the specific threat on the minds of security planners. Hatched in Pakistan’s badlands, the alleged plot (or plots) aimed to conduct a Mumbai-style assault on a European city (or cities) in which a team of terrorists would wage open war on the streets killing in the name of God. For the UK, the specifics of the latest threat appear to focus around a British-Pakistani militant from the Jhelum province of Punjab named Abdul Jabbar. Allegedly killed during a drone strike in Waziristan which also killed top Al Qaeda leader Fahd Mohammed Ahmed al-Quso, Jabbar had apparently been put forwards in July as the leader of a group dubbed “Islamic Army of Great Britain” that was tasked with planning a Mumbai-style attack in the United Kingdom. While British officials were keen to downplay the state of readiness of the plot (and some Pakistani officials rubbished Jabbar’s existence), the BBC’s flagship Newsnight program claimed that “senior security sources” in Pakistan had revealed to them that Jabbar was a long-time jihadist who had featured in previous investigations. Jabbar, according to the BBC, was named in a document provided to security sources by Mohammed Junaid Babar, the American-Pakistani “supergrass” who was arrested in April 2004 and who provided detailed testimony about a broad network of British plotters. Babar’s testimony revealed that Jabbar was from East London and that around the time of September 11, 2001, he and his brother had gone to Afghanistan to fight alongside the Taliban. Following the fall of Kabul, the two men moved to Pakistan where they connected with infamous British jihadist Omar Saeed Sheikh who helped them get to training camps in Kashmir. Sheikh is currently on Pakistani death row having been found guilty of the murder of Wall Street Journal reporter Daniel Pearl. Jabbar was also believed to be close to Omar Khyam, the leader of a cell of British Muslims who were convicted for plotting to carry out a large explosion using a fertilizer based bomb. This is the second time in recent months that this cell has been in the news: in July, following the discovery of an Al Qaeda connected cell in Oslo, recent passport photographs were discovered of Adam Ibrahim, the brother of another of the men convicted for the fertilizer bomb plot. Another associate of this cell, Kazi Rahman, is currently incarcerated having attempted to buy Uzi submachine guns and rocket propelled grenade launchers off undercover agents in the UK. Britons are not the only European’s of concern who are running around Waziristan. German security services continue to monitor regular flows of individuals back and forth from Pakistan, with a recent senior security source stating that in the past 10 months some 40-50 individuals have gone to train, and overall at least 70 fighters had done this for sure. Approximately a third of this (25 or so) were currently back in Germany part of a larger pool of some 1,000 individuals of concern. The current threat appears to have emanated from a cell linked to a group of some 11 young men and women from Hamburg who used to frequent the now-closed Taiba Mosque – previously the spiritual home to some of the September 11 plotters. In early 2009, something appears to have driven the community from talk into action and in various groups they started to make their way to Waziristan. Not all of them made it, and some were amongst the 26 “potentially violent Islamists” that German Federal Criminal Police Office (BKA) head Jörg Ziercke stated his forces had prevented from leaving the country to fight since early 2009. Others instead ended up being killed by Predator strikes, likely in part as a result of information obtained from captured members Rami Makanesi and Ahmed Sidiqui. A German-Syrian in his late 30s, Makanesi was captured by Pakistani forces while attempting to reach a hospital dressed in a burka. He is apparently now back in Germany providing information in exchange for a lightened sentence. Ahmed Sidiqui, a German-Afghan, was instead caught in July by American forces in Kabul who have been quizzing him in detention. It is from these men that it is believed much of the information about the current Mumbai-style attack has come. According to reports in the press, Ahmed Sidiqui claimed that during a “fireside chat” with top Al Qaeda commander Ilyas Kashmiri, the Al Qaeda leader boasted of already having advance cells in place in Britain and Germany. Other reports suggested it was in fact al-Quso who was talking about this plot. Supplementing its own information with details garnered from the captured Germans and sigint from Britain’s GCHQ, the U.S. launched a sustained series of Predator strikes in September and early October this year which appear to have staved on any imminent attack. British and German authorities have remained calm in reaction to this elevated threat level – something that stands in contrast to their French counterparts who have repeatedly spoken of their concerns on public airwaves. In early September both the Interior Minister, Brice Hortefeux, and domestic intelligence head, Bernard Squarcini, separately spoke of the “all the red lights” flashing. The threat was believed to be coming from North Africa with intelligence passed along from Algerian sources that a female suicide bomber was apparently on her way to Paris. She never materialized, but at the same time, French forces asked their Italian counterparts to pick up Ryad Hannouni, a 28 year-old French-Algerian veteran of the Afghan conflict believed to be involved in a network sending fighters to South Asia and whom they had heard was returning to Europe via Italy. Assessing he was not an immediate threat, Italian security followed Hannouni for a few days before arresting him in Naples on September 3rd. Once arrested, they discovered a kit to make explosives, as well as an address book and mobile phone. This wealth of information led, a month later, to a series of twelve arrests in Marseille and Avignon in France which turned up ammunition, an AK-47 machine gun and a pump action shotgun. Hannouni is currently awaiting extradition to France. Even with these arrests, however, the immediate threat to France does not seem to have gone away. On October 18th, Interior Minister Hortefeux went on the airwaves to announce that “a few hours, a few days ago, [we received] a new message, from the Saudi [intelligence] services, indicating to us that Al Qaeda in the Arabian Peninsula was certainly active.” The threat was apparently directed at “the European continent and France in particular.” It seems likely that this information came from the same source that provided the Saudi’s with detailed knowledge of the parcel bombs en route to Chicago from Yemen. Ten days after Hortefeux launched this alert, a new recording emerged on the forums and Al Jazeera in which Osama bin Laden threatened France in particular, highlighting France’s involvement in Afghanistan and criticizing the decision to ban the veil in public places. As he put it, “If you deemed it right to ban women from wearing the hijab, then should it not be our right to expel your invading men by striking their necks?” He also seemed to provide a direct link between France’s actions and the move by North African affiliate Al Qaeda in the Islamic Maghreb (AQIM) to kidnap a group of French citizens in Niger. All of which highlighted the very real threat from France’s former colonial backyard that continues to be high on the list of threat for French policymakers. The drumbeat of terror in Europe goes on: while in the United States, Ashburn, VA citizen Farooque Ahmed was casing metrorail stations in the Washington area for individuals he believed to be Al Qaeda, the actual network continues to keep Europe firmly in its crosshairs. A new post for HSToday, a bit delayed as I have been traveling somewhere even more remote than usual. My computer has also come crashing down which has set me up with some serious problems. More on this plot to come. Across Europe there has been a noticeable up-tick in threat tempo. From a series of intelligence-led operations across the continent, to high level statements by the French Interior Minister and US Homeland Security Secretary Janet Napolitano – those paid to protect us are very concerned about something. It is unclear at which point this specific set of alarm bells went off, but they have been ringing for some time. In the United Kingdom, in the wake of a series of arrests back in July in Oslo it was revealed that a British jihadist who had disappeared off radars for a few years had re-emerged in the form of a series of passport photographs found in the possession of the alleged leader of a cell of plotters that was planning an unspecified campaign at the orders of possibly dead Al Qaeda leader Saleh al Somali. The pictures showed the British-Algerian Ibrahim Adam in a variety of different haircuts and had apparently been obtained by the cell leader, Uighur-Norwegian Mikael Davud, from a contact in Turkey in September 2009. The discovery caused a spike in concern for British counter-terrorists, leading them to suspect that Adam, whose brother Anthony Garcia (the family all changed their names to integrate better) was incarcerated as part of the Al Qaeda directed plot to explode a large fertilizer bomb at a British mall, may be on his way back to Europe to conduct operations. Nothing materialized, until, concurrent with the first day of the Pope’s visit to the United Kingdom on September 16th; police raided a series of properties in London arresting a group of six men working for a city garbage disposal company. One of the men was described as being “of North African appearance” and the BBC has since revealed that at least five of them were “thought to be Algerian.” The men were questioned by police but ultimately released as it was revealed that the intelligence that had led to the arrest had been only picked up recently and was not part of a long-term operation. Unconfirmed reports suggested that the intelligence had been garnered by the police from someone who had overheard the men talking in a staff canteen. However, the police reaction to the threat showed the elevated concern around the current threat level. The day before the arrests, the head of the Security Service (MI5) had warned that “the main effort for the Security Service remains international terrorism, particularly from Al Qaeda, its affiliates and those inspired by its ideology.” He highlighted the particular growth in the threat from Somalia, stating “there are a significant number of UK residents training in Al Shabaab camps” and highlighting that the threat from the tribal areas of Pakistan now only accounted for about 50% of the “priority plots and leads” coming into the Service. The evening before the men supposedly behind the threat to the Pope were released, British intelligence passed on information to their Dutch counterparts about an individual on a flight from Liverpool transiting through Amsterdam on his way to Entebbe, Uganda. The man, described by a Dutch spokesman as “a British man of Somali origin,” was pulled off a KLM plane which was about to depart on suspicion of “possible involvement in a terrorist organization.” He was also released a few days later cleared of any charges and it is unclear where he has since gone. This was the second time in less than a month that individuals going through Schipol airport had been picked up as a result of terrorist concerns. At the end of August two Yemeni men were pulled off a flight landing in the airport from Chicago after a tip-off from U.S. Department of Homeland Security. This also did not result in any charges being made. In France in the meantime, the Interior Minister Brice Hortefeux joined the head of the domestic intelligence agency, Bernard Squarcini, in highlighting the level of threat the country faced. On September 16th, visiting the Eiffel Tower after the latest in a number of bomb scares on the site had further stepped up the security presence, Mr. Hortefeux said, “these last days and hours, a number of events have reminded us that we find ourselves in a period which calls for an elevated level of attention in the particular face of terrorist threats.” This echoed earlier statements the week before by Mr. Squarcini who said that the “all the red lights were flashing” and a story that surfaced in the French press which revealed that, “a female suicide bomber was plotting to commit a terrorist act in a busy part of Paris.” The information was allegedly passed on from Algerian intelligence and resulted in mobile anti-terror units being mobilized across the city searching for the woman. This comes in the wake of a series of kidnappings in Niger of French citizens by the group Al Qaeda in the Islamic Maghreb (AQIM), the North African Al Qaeda affiliate. French authorities have apparently attempted to reach out to the group in North Africa to get their citizens back, but little more is known about the alleged female bomber. The threat echoes an alert from earlier in the year published by British newspaper the Daily Telegraph which suggested that security services were concerned that a team of female suicide bombers were being dispatched by Al Qaeda in the Arabian Peninsula (AQAP) targeting the United States. In that case too, nothing ultimately emerged but it set the tone for a year which has been plagued with repeated alerts. But amidst this sea of unrealized threats, on the eve of the anniversary of September 11, Danish police leapt into action when a bomb went off in a hotel toilet in central Copenhagen. The responsible individual was rapidly caught in a nearby park, but refused to provide his identity leaving Danish police with a puzzle to establish who the one-legged multi-lingual individual was. He was eventually identified as a Chechen former boxer who for unspecified reasons was apparently trying to send a bomb to the Danish newspaper Jyllands-Posten (infamous for publishing the Muhammad cartoons in 2006). Picked up with a gun, a very rudimentary explosive and a number of false identities, the initial fear was that Lors Dukayev, who maintained his anonymity for some time while under arrest and was only identified after someone saw his picture in the press, was possibly more than he initially seemed. Currently, however, he appears to have been a “Lone Wolf” with no connections. And then on the morning of September 21st, Italian police intercepted a container-load of explosives at the port of Goia Tauro. Hidden amongst powdered milk were 7 tons of military grade RDX explosive, a massive amount which resulted in the Italian foreign minister Franco Frattini calling his American counterpart Hilary Clinton to discuss the matter directly. Believed to be en route from Iran to Syria, the cargo had in transit when Italian forces acted on intelligence believed to have been passed on by Israel. The year has already seen a number of plots dispatched by Al Qaeda affiliates or fellow travelers reach fairly advanced stages (Umar Farouk Abdulmutallab and Faisal Shahzad to name but two), showing the capacity exists for such attack planning. Whether this new wave of concern from Europe’s services is going to translate into a similar attack remains to be seen, but it seems as though intelligence services across the continent are operating at full tilt. Raffaello Pantucci is Homeland Security Today’s London correspondent. A new post over at Free Rad!cals, which is in the middle of a relaunch. Lets hope it goes well! In the meantime, the piece looks at two films I recently saw about terrorism in the West – both worth watching. One thing I would add is that I provide a link in it to my earlier Studies in Conflict and Terrorism piece, which is behind a firewall. There are a few pieces on this site like that – apologies, but if you want to read them, use the contact form to drop me a note and I can see what I can do. I have recently indulged in watching a couple of films which in different ways handle contemporary terrorism. One is serious and one is less so, but both did inspire me to think about issues around some of the questions they raise. While my aim is not to provide a substantive critique on the films themselves, undoubtedly some opinion will slip in. First up (in alphabetical order) is Four Lions, British satirist Chris Morris’s take on Islamist terrorism in the UK. In true Morris style it is a mordant comedy which pulls no punches in highlighting the sheer stupidity and inadequacy of the majority of young men who become involved in jihadist terrorism in the UK. The men are religiously illiterate and lead meaningless lives which are focused around whatever banal things fill the average middle Englander’s day. Morris claims much of the material he has used came from amongst the reams of research into court documents and interviews he has done with people who have become involved in Islamist terrorism in the UK. I have no doubt that this is true – I have spoken to a number of security professionals who have at various points in my endless questioning about various plots and plotters highlighted to me what morons these chaps actually are. And in some cases, you really have to wonder. Omar Khyam, the leader of the Crevice plot, was busted after he forgot the bomb-making recipe he had learned and emailed his friend in Pakistan a rather blatant note inquiring about the specific volumes. Eventual “super-grass” Mohammed Junaid Babar was so discrete that he thought it would be a good idea to go straight to the hotel where all the foreign journalists were staying in Lahore and announce that he had radical ideas and was willing to do interviews about it. This landed him a prime-time slot on international TV and arrest as soon as he stepped back onto U.S. soil. Rangzieb Ahmed, the first man to be jailed in the UK for being an “Al Qaeda director,” was unclear what exactly a bidet was and thought it might be a bath for small people. And the list goes on. One case which Morris highlighted in interviews is of a plotter who snorted some TATP thinking it was cocaine – I have been unable to pin down exactly who this was and would appreciate any pointers. But for me, the fact that they are idiots is not all that relevant. Some of them may not be all that smart, but they are nonetheless playing with dangerous toys which can lead to innocent deaths. That they have no idea what they are doing, are religiously illiterate and are buffoons is somewhat tangential if they are able to actually follow through on what they are attempting to do, albeit in their half-baked way. Morris hints at this towards the end, but it is an important point to remember when considering these people as idiots. People treated Abu Hamza like a clown who had been delivered by central casting to act as a real-life Captain Hook until it became clear exactly what he was facilitating. This is not to exaggerate the menace, but neither is it a good idea to completely dismiss it – the real point is that hopefully such satire will help demystify these groups a bit. The second film, which is probably less well-known outside a specialist audience, is called “La Prima Linea” (translation: the first line – it was the name of the group). It is an Italian film which looks at a terrorist group that existed in Italy during the Anni di Piombo (years of lead) during which left and right wing terror groups shot and blasted their way around the country. The group was second only to the more notorious Brigate Rosse (red brigades) in number of activities and members. Based on the memoirs of one of the group’s commanders, the film does for the group much the same as “The Baader Meinhof Complex” did for the Rote Armee Fraktion (Red Army Fraction). In the film we see how the group launches a massive assault on a prison to release their comrades. A rather foolhardy act in many ways, but nonetheless it does provide evidence of how strong the bonds are between the members of the group – a dynamic which is part of Marc Sageman’s “bunch of guys” theory. Much is made of the emotional bond between the individuals in the group (in true Italian style, two fall in love), and the fact that over time, the political content of what they are doing starts to lose its power and not wanting to let down your comrades takes over as a driving motivation. Early on we also see how, though they don’t think that they are necessarily going to achieve their goals, they are certain that something should be done and a vanguard needs to lead the way with action. In an earlier post looking at the RAF, I (in a highly caveated fashion) pointed out some of the similarities between these leftist groups and current Islamist groups. This film adds some depth to this discussion in showing how the dynamics of the relationships in such groups might work – though it is unclear that current groups are necessarily structured in as hierarchical a fashion. More for Free Rad!cals, this time returning to my previous theme of Lone Wolves in Italy. It covers a bit more ground around the theme, and the trials will be worth watching as they go forwards as they present a possible irritant that security services will be having to watch for a while. It has also given me some more thoughts for a longer piece I continue to trudge through on the theme. My first substantive post to this blog was on the topic of terrorism in Italy and the attempt by Mohammed Game to blow himself up at a barracks in Milan. Fortunately, no-one was killed in Game’s attempt and he remains in custody along with two alleged accomplices – the three are going on trial (in two separate cases) May 12 and June 26. While undoubtedly more information will come out during the trials, it would appear from what is already in the public domain as though Game and his contacts were a relatively free-standing “Lone Wolf” terror cell. A phenomenon which appears to be increasingly common in Italy, where details have just been revealed about the reasons behind the expulsion of a couple of Moroccan students from Perugia University towards the end of April. The two students, now apparently living freely in Rabat, were thrown out of Italy following an assessment that they were a threat to public safety. It has now been revealed that Mohammed Hlal, 27, was overheard saying that he wanted to kill the Pope in order to guarantee himself a place in paradise, part of a regular digest of anger apparently directed at the Catholic Church. It is unclear what role his accomplice 22-year old Ahmed Errahmouni had in the plot, though a wide array of images of famous Italian locations were found in their possession, alongside numerous maps, and an instruction manual on how to build bombs. No actual weapons or explosives were located, though apparently confiscated computers had encryption programs installed. Italian services had been alerted to the two in October of last year, following unspecified leads about concerns being expressed of radical views heard amongst some Moroccan students in Perugia. An investigation was launched, and in late April a series of arrests were made, allegedly because the group was becoming more isolated and radical and there were concerns that some action might be on the horizon. In the initial sweep another four Moroccans, a Tunisian and a Palestinian with an Israeli passport were also picked up: the group apparently used to attend the same mosque in Perugia. Reporting to have emerged from the cell appears to point to the fact that it was a largely self-contained group who self-radicalized – much like the narrative being painted around Mohammed Game and his cell. This is a phenomenon which Italian investigators are seeing an increasing amount, including in the case further north of Abdelkader Ghafir, 44, and Rachid Ilhami, 31, two Moroccan laborers accused by security head Bruno Megale of being in a cell like Game’s atlthough in an earlier phase (two others stand charged of immigration offences alongside them). Those men’s trial is currently ongoing. And Game’s cell has been repeatedly referred to in the context of the Perugia cell that threatened the Pope. In all cases, the groups appear to be self-contained and have (according to reporting) no connections to Al Qaeda core or a regional affiliate. The individuals involved appear to be mostly of North African extraction (like most Muslim migrants in Italy) and male, but aside from this they tend to defy uniform classification. Their radicalization appears for the most part to be self-generated, though they appear to also operate on the fringes of known networks. In the case with the Game group who were also linked to the radical Viale Jenner mosque in Milan, a former Imam of which was incarcerated last month, while Ghafir and Ilhami were also apparently helping run a local Islamic center. According to the press, the other students involved in the Perugia sweep are being looked into for connections. In my earlier post on Game I described the group as a Lone Wolf Pack – something I have been exploring in greater detail in a longer paper that I am currently working on. The phenomenon is not in fact isolated to Italy, both the Fort Dix group in the United States from 2007 and Jihad Hamad and Youssef el Hajdib, who in July 2006 left a set of suitcase bombs on a Cologne train, have elements similar to the Italian groups. What is interesting, however, is the apparent high instance of these sorts of groups in Italy – I have yet to see any analysis as to exactly why this is (of course, it has to be said that all of these Italian groups are being tried or are on trial (or have not been tried and simply ejected from the country) – so they are in fact still innocent until proven guilty. Only Game would appear to be conclusively guilty of something). What is not clear is to me yet is whether these sorts of groups coming together is something which needs to be analyzed within the context of Al Qaeda plots or if it should be analyzed within the context of trying to understand the impact of the internet as an accelerant of the ideology. Or maybe it is something which is a social phenomenon which needs to be understood using the sort of social network analysis that Marc Sageman deploys. Whichever is the case, it would not surprise me if this sort of phenomenon in one way or another becomes an increasingly important element of counter-terrorism in the West that will require deeper understanding and research.